Zigmunds Priede is an historically relevant printer, having worked for years at the esteemed publishing house ULAE, collaborating with the likes of Robert Rauschenberg, Jasper Johns, Chuck Close, and many more. Today, Zig is primarily an engaging artist, feeling his way into his work with a mesmerizing sensitivity, quietly influencing the eyes and hands of those artists and students who were lucky and open enough to fall under Zig's tutelage. The Magical City series, a vibrant array of woodcuts printed on wood veneer, is based on recurring dreams that arrive in the mind of Zigmunds Priede. Each magical city is a composite of many different locations in the world, arriving just at the distance of the artist’s imagination, in between his native Latvia and the United States. As is the case for many who find themselves living abroad from their native lands, home is no longer the place that has been left behind, nor is it the place one now lives. For Zigmunds, this beautiful series of work is his attempt to deal with these notions of home, using cities as an emotive expression, rendered in many different color relationships. >> Read more. After finishing at the University, Zig and some friends drove to California in a blue 1954 Ford, completed a graduate degree from Berkley, then was hired on to work as a Master Printer at Universal Art Editions Limited, where he printed for many of the great artists of that era. If one were to make a list of the most important American printed works, it is likely that Zig Priede’s name would occur on that list several times. Zig Priede was an excellent teacher who inspired may of his students towards successful art careers. 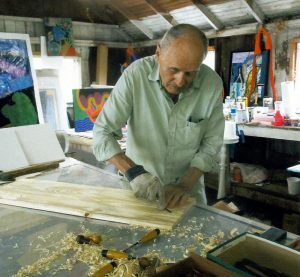 His connections at Universal allowed Zig to challenge many of his students to become respected artists and Master Printers. In fact, many of Zig’s students went to New York to pursue art and printmaking careers. Zig is famous for inspiring artists as printmaker and teacher, however, Zig’s drive today is his own art making process, where he returns to his studio daily.